This demands considerable organisational agility. 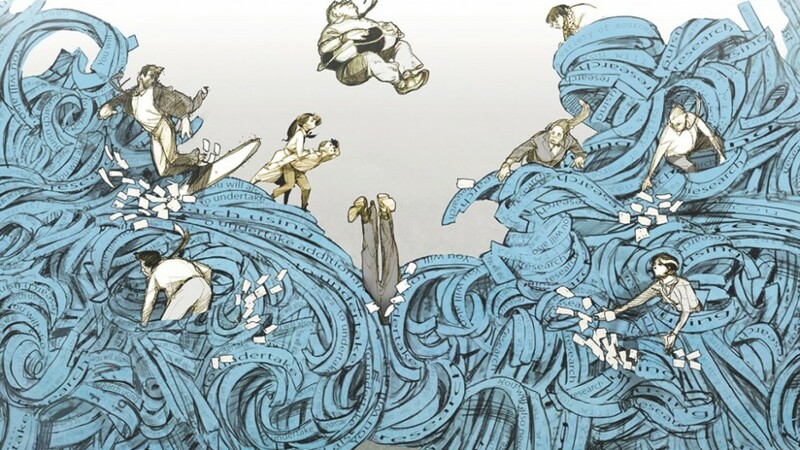 Whilst ‘agility’ is nothing new, these changes to the very nature of organisations raises questions about what is appropriate to measure, to regard as legitimate information to guide decisions and actions. In this article I suggest sources of measures that may be unfamiliar, not the usual suspects. I challenge assumptions about what organisational data we measure, what matters and where to look for it. People optimisation: the ‘contributions of value’ from our staff which show that we are optimising their capability, will and opportunity to perform, as they change, adapt, grow. Attract, deploy, develop and let loose our talent bank. To get into the detail of what is meant by moments of truth please refer to our website where I explain what Jan Carlson meant by the term as expressed by the work of Parasuraman et al. It is illuminating material! The potential disappointments or joys for the customer include both the tangible product or service, (what I actually experienced compared to what I wanted), and the quality of the relationship between supplier and customer. Additional opportunities to under-perform occur when the design intention fails to manifest into what is created (the big idea compared to what was specified and what was produced). In today’s organisations of perpetual motion, uncertainty and transient relationships, these potential performance gaps are core sources of data needed to guide and steer improvement and success. What do we need to know to be able to close or prevent those gaps, to optimise the moments of truth for customers? In an earlier OE article, “Kon-tiki of Change”, I explored the realities of organisations continuously on a journey. Not only do we need to constantly review what is happening at those potential gaps but we also need to revise what we deliver as new customers with new demands appear, along with new suppliers and different staff, using a different mix of resources and tools. That requires a continuous cycle of scanning our market place and beyond, defining possible scenarios to pursue and then determining action – change tack, alter course entirely, keep straight on. So, what do we measure? What will tell us there is an opportunity or risk out there? What about new stakeholders and players – how do I know who is important? The current breadth and depth of data available electronically – about the world, governments, regulation, people, competitors and so forth – poses the problem of what is relevant, how to sift through it, validate it and synthesise it to make sense for us. We need criteria and parameters that guide us, though we also need to review and revise the criteria as events change. Points of progress need to be regularly revised and made explicit, based on the most useful indicators we can obtain. In the moving organisation, leaders are also faced with questions about what skills, capabilities, attitudes, strengths are best suited to the next phase of progress as roles and structures change. Importantly they need to decide what to specify and what to leave to staff’s judgement. Continuous change and adaptation could suggest an industry of continuously updating specifications. But we cannot be fleet of foot if we take that route – too much lag in the system, too much resource not adding value at the customer interfaces. Geary A. Rummler and Alan P. Brache described ‘white spaces’ to indicate the gaps that open up between jobs when the weight of attention goes into boundary specification at the cost of effective activity flows and emergent value adding contributions. 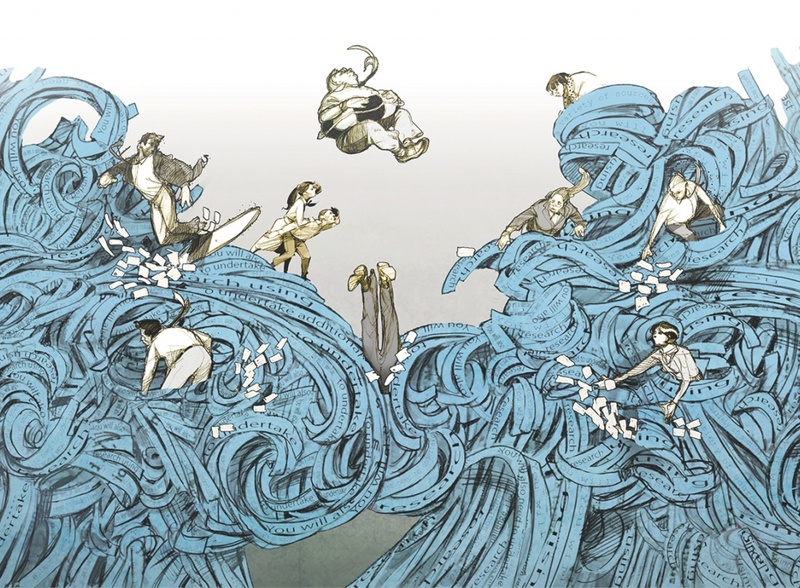 Effective, agile organisations no longer specify every method and process. Where it used to be prudent to live by ‘service level agreements’ and boundaries of responsibility, the focus now is more on quality of relationships and the permeable borders between parties that allow mutual optimisation. Organisations charge their staff with delivering required outcomes, using limited sources and resources. We need informed and broad-minded yet speedy reactions to performance, emergent issues and opportunities. So, what data will inform us about the quality and scope of such relationships? What data will tell me the whole ‘system’ is working and moving – rather than data that’s simply a snapshot in time. We need to measure three things in terms of customer opportunities and partners to guide us along the organisational journey: the range and levels of resources, how they are changing, their usefulness, challenges and breakthroughs in their application; the range and levels of capability and how they are applied and both these as they relate to the third – the specific outcomes we seek. We need to observe what capability we have, how it is deployed, where it is working best/worst, what is helping or hindering its contribution? Who is creating the customer experiences, observing what is happening and deciding on next steps? How do leaders galvanise staff to work effectively, flexibly, adapting yet delivering? What do they understand their jobs are about? For what are they held accountable? What kinds of staff are suited to work in this way? Leaders need to grasp and respond to another three things for value-adding contributions to result: how staff deal with complexity and uncertainty; what motivates or drives them to act with enthusiasm; what personal investment they make to keep learning and developing capability. These aspects apply to leaders, staff, partners, allies, suppliers, competitors, and all. With psychometric profiling tools, we can access the drivers and personal values that underpin how each of us approaches work and learning, the preferences and traits that shape our ways of working, our technical, cognitive and behavioural capabilities that focus our effort and achievements, and which work environments enable us, in all our differences, to flourish. They give leaders input data to inform decisions about who to focus on what. Output data is in the form of deliverables and results, comfort with work and environment, turn-over and retention levels. The more we have to depend on people working well together, making judgements, taking responsibility for micro-shaping what is created and made for our customers, the more we need to understand, in an active sense, about our people, how well they are being selected, developed and deployed. And Then There are the Interfaces! Currently, many organisations compartmentalise measurement and data. HR measures most stuff about people, both input and output. Owners of ‘CRM’ measure the customer experiences. The Strategy, Finance and Change functions separately measure elements of organisational progress. Where and how do they come together to indicate how the system is working? 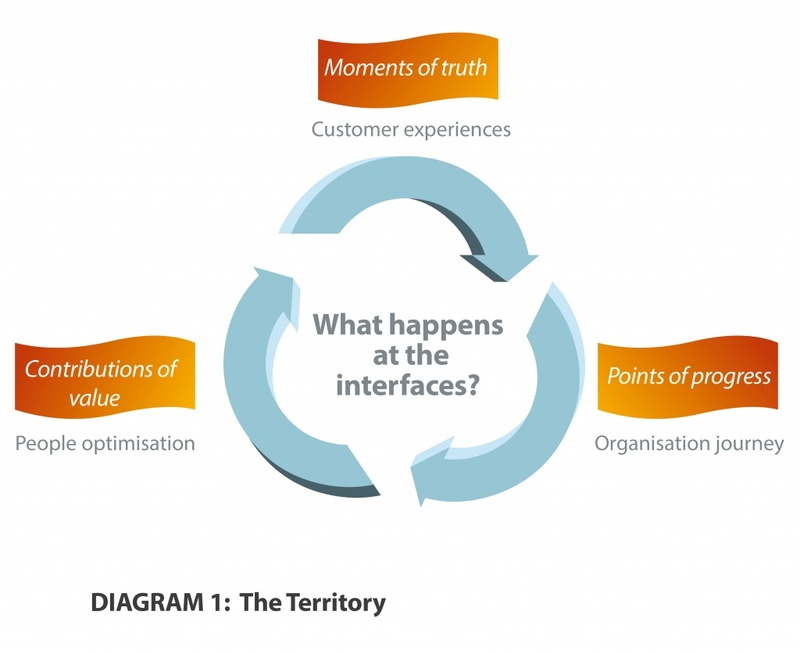 The three dimensions of customer experiences, organisation journey and people optimisation do not just co-exist, they interact. I believe it’s at these interfaces where leaders can find the most powerful sources of data to inform smarter decisions. So, where do we look for such measures? How we identify the product or service that will be successful, socially enhancing and made ethically. Remember reputational backdrop informs people’s expectations of an organisation’s products or services. How a product or service concept is developed into a deliverable – think of Steve Jobs and his collaborative approach to product quality and functionality. How we observe what really happens at points of delivery and how it fine-tunes or drastically changes what is done and delivered. Think of the crew on a yacht continuously reading 3-dimensional signs that inform their micro and macro-decisions. How we scan for and spot potential allies, partners, staff, suppliers who open our eyes and minds to wider possibilities and want to go where we are going, at least some of the way. Think of extracting synergies within conglomerate businesses and successful unlikely alliances, like Visa with Marvel Comics. How we sustain the quality of relationships that enable dialogic conversations (see Richard Sennett), collective sense-making and co-creation of mutually acceptable progress. Think of an orchestra with its diversity of instruments and players who continuously learn from each other as well as the conductor to produce great music. How we allocate editorship or judgement that ensures real-time decisions add value and work. Think of the nurse or doctor faced with an emergency. How we channel data into meaningful diagnosis and apply editorship to confer materiality on what is best to do next, given constraints. Think of publication editors who work to condense and crystallise data against performance standards for a defined purpose. How we engage personal passions to optimise customer experiences, however far removed we are from them. Think of the guy sweeping the corridors at NASA (as was) proudly proclaiming that he was helping put a man on the moon. How we galvanise readiness and effectiveness of internal and external parties to work together, at short notice, to be innovative, shape customer expectations and make a difference. Think theatre troupes! Our decisions are restricted by the current formality of tightly defined roles, legacy measures and reporting techniques. But we must ask how readily they illustrate sound understanding of how the organisation is doing? We still need the bottom line data, the regular indicators of organisational performance. However, we need a more creative look at the nature and sources of ‘how’ data and making data smarter through synthesis and use. I suggest sources of data that operate dynamically to better illustrate how customers experience the organisation, how the organisation stays agile and how people contribute best. Where are you looking for ‘smart’ data – data that will inform a smarter operation and deliver more success? 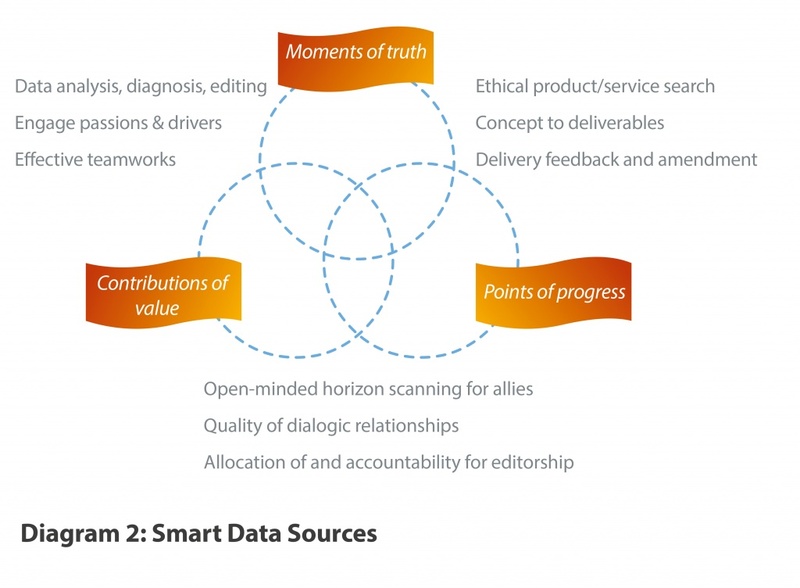 Given the overwhelming wealth of available data, much of it opinion not fact, how do you enable more people to act as editor, in its fundamental sense, so that relevance and materiality inform decisions and action, within a wider, shared purpose? OE Cam applies its expertise to help our clients determine what data matters.